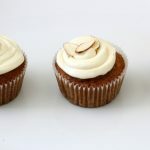 These masala chai carrot cupcakes have feature the traditional carrot cupcakes, but flavored with a hint of black tea and spices for an even more flavorful carrot cake. Pour the boiling water over the tea and let steep for 10 minutes. Strain the tea, and discard the tea leaves. In a large bowl, whisk together the sugar, eggs and tea until combined. Add the oil and whisk until the mixture is completely emulsified. Fold in the carrots until combined, then fold in the flour until no visible specks of flour can be seen. Quickly fold in the raisins. Transfer the batter to 24 lined cupcake wells and bake at 350F for about 20-25 minutes. The cupcakes should be golden brown and a toothpick will come out with a few crumbs when inserted into the center of a cupcake. Cool for a few minutes in the pan, then transfer the cupcakes to a wire rack to cool completely. Cream the cream cheese, butter, sour cream, extract and salt until light and fluffy. Add the sugar, then beat until combined. Adapted slightly from A Brown Table. You can make the cupcake batter in a food processor. Click through to the link above and follow the instructions there.